BP Aero is committed to provide excellent service to our valued customers while always adhering to OEM and CAA regulatory requirements. A strong emphasis is placed on streamlined processes to result in high quality products and services. BP Aero maintains FAA, EASA, CAAC and ISO9001:2008 certification to better serve our global customer base. We always strive for a zero defect culture and we proactively design processes to eliminate paperwork and processing errors. We train our technicians and inspectors specifically for each process and we perform random audits to check sustainability and consistency of our processes. We utilize root cause analysis software to review defects we catch internally with the goal of zero external defects reaching our customers. 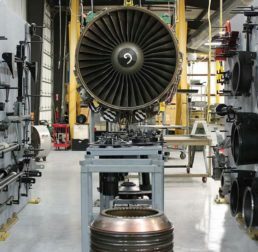 BP Aero maintains an FAA/EASA repair station certificate specifically for our Engine Services business. We are committed to following OEM manuals for engine disassembly, hospital shop visits and field service repairs. We run a streamlined shop with shadow boards for tooling, manual availability on large monitors in each engine bay and provide detailed instructions for each engine visit.